Mostly ranging south of Michigan, a vegetative plant was collected in 1910 along Lake Erie, Monroe Co. (O. A. Farwell 2188, BLH). 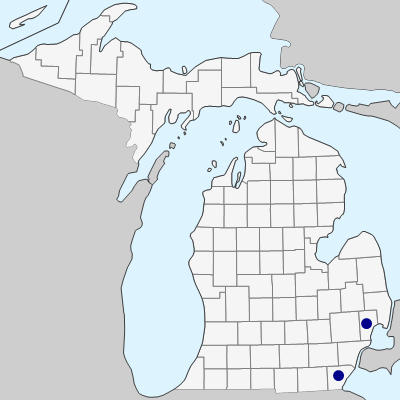 The species has evidently been spreading northward (e.g., to the Chicago region and the islands of western Lake Erie) and is likely to be found eventually again in Michigan, probably in the Lake Erie marshes. The leaf blades are often broadly hastate. 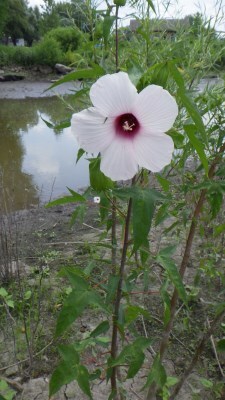 A recent Macomb Co. collection is from a wetland restoration, and is of unclear status as to wild or planted. MICHIGAN FLORA ONLINE. A. A. Reznicek, E. G. Voss, & B. S. Walters. February 2011. University of Michigan. Web. April 21, 2019. https://michiganflora.net/species.aspx?id=1670.